Today we commemorate a sacred history of unexampled love, supreme sacrifice, and divine vision. It is a narrative prefigured in the pronouncements of the great seers of the past. As we stand awestruck at the majestic structures and the "tapestry of beauty” now defining the face of God's Holy Mountain, and ponder the mysterious processes responsible for the remarkable transformation of this once barren domain, the words of Isaiah echo on all sides: "The wilderness and the solitary place shall be glad for them; and the desert shall rejoice and blossom as the rose.. . the glory of Lebanon shall be given unto it, the excellency of Carmel and Sharon, they shall see the glory of the Lord, and the excellency of our God." This occasion offers us the opportunity to look back at a fate-laden and triumphant spiritual journey. More than 150 years ago, a youthful Prisoner, banished to a desolate mountain fortress, boldly addressed the ruler of Persia in these words: "I am the Primal Point from which have been generated all created things. I am the Countenance of God Whose splendor can never be obscured, the Light of God Whose radiance can never fade." Speaking with an astounding power reminiscent of the Prophets of old, the Báb proclaimed the arrival of a new Day, that long anticipated moment in human history when the Promised One would "fill the earth with equity and justice" and "with the knowledge of the glory of the Lord"
His "trumpet-blast of knowledge" awakened the darkened land of Persia and endowed all who responded with "a new eye, a new ear, a new heart, and a new mind." His message, though, was not directed to that land alone, for He was the Bearer of a Revelation destined to transform the spiritual life of the human race. "O ye peoples of the earth," the Báb declared, "Enter ye, one and all, through this Gate…” To pass through this Door was to step out of the darkness into the light of God's love and compassion; it led to the "Path of Truth" and to the "ways of peace." The Báb was the portal through which the long expected universal Manifestation of God would soon appear. He clarified the central aim of His mission by explaining that "the purpose underlying this Revelation, as well as those that preceded it, has...been to announce the advent of the Faith of Him Whom God will make manifest." The basis for all human accomplishment is to be found in the teachings of this Most Great Luminary, and "the sum total of the religion of God," He says, "is but to help Him." For the Báb, a climacteric in human development had been reached, and He was the "Voice of the Crier, calling aloud in the wilderness of the Bayán” announcing to humanity that it was entering the period of its collective maturity. The unbounded ardor and intrepidity engendered by the Báb's clarion call marked the first chapter in an extraordinary drama of spiritual and moral renewal. The heroism of His lovers, their superhuman fortitude, and deeds of consecration shook Persia to its depths and attracted the attention of the world. Engulfed in a maelstrom of fanaticism and hate, the followers of the Lord of the Age evinced prodigies of courage and devotion that defy all description. "Through the blood which they shed," Bahá’u’lláh affirms, "the earth hath been impregnated with the wondrous revelations of Thy might and.. .Thy glorious sovereignty." And it is that same blood, Shoghi Effendi states, which constituted "the seed” of a divinely conceived administrative order "destined to overshadow all mankind."' 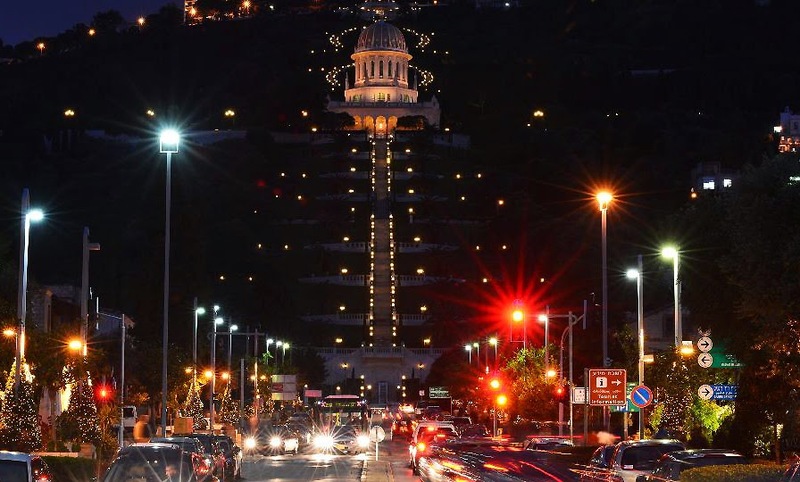 We cannot forget, then, the shedding of this "crimson ink" by the thousands of Bábí heroes and heroines when we gaze upon the monumental structures on the Mountain of God. At the center of our thoughts is the ultimate, the glorious sacrifice of the Exalted One Himself. The "Fruit of the Tree of God's successive revelations" yielded its precious seed to the "mill of adversity" in the city of Tabriz, quenching temporarily the "Flame of that supernal Light..." When contemplating the inexplicable phenomenon of the Báb's martyrdom our hearts are filled with wonder, and we are moved to exclaim our powerlessness before One Who is Omnipotent. "The whole world," Bahá’u’lláh testifies, "rose to hinder Him, yet it utterly failed. The more severe the persecution they inflicted on that Sadrih of Blessedness, the more His fervor increased, and the brighter burned the flame of His love." He Who was "the Herald of a new Era and the Inaugurator of a great universal prophetic cycle" had, in the words of one prominent European writer, "sacrificed himself for humanity.... Like Jesus he paid with his life for the proclamation of a reign of concord, equity, and brotherly love." Deprived of the youthful and magnetic Voice which was its instrument, the mysterious "God-borne Force" animating the new Revelation then began to pulsate within the gloom and darkness of the Síyah-Chál. There, "He, for Whose sake the world was called into being," the Supreme Manifestation of God anticipated by the Báb and all the Chosen Ones before Him, began to radiate the Light of an all-embracing and transformative love. From that "Black Pit" of deprivation and despair, the "Wronged One of the World” and the "All-Knowing Physician" arose to diffuse the "divine remedy" of unity to the ends of the earth. "...He Who is the Ancient Beauty hath come," Bahá’u’lláh Himself avers, "...that He may quicken the world and unite its peoples. They, however, rose up against Him with sharpened swords, and committed that which caused the Faithful Spirit to lament.. .. At one time they cast Him into prison, at another they banished Him, and at yet another hurried Him from land to land." Bahá’u’lláh suffered so "that all the dwellers of.. .earth" could be "born anew." And as He attests in His Most Holy Book, "Because He bore injustice, justice hath appeared on earth, and because He accepted abasement, the majesty of God hath shone forth amidst mankind." Overcoming torture, imprisonment, betrayal, and exile, and scorned by political rulers and religious leaders alike, He, the "Unifier of the children of men" and the "Organizer of the entire planet," succeeded in bringing into existence a worldwide community dedicated to belief in the oneness of God, the oneness of all the great religions, and the oneness of the human family. He had revealed Himself to stir humanity from its "strange sleep," to awaken it to its innate excellence, nobility, and beauty. The mystical quest had been redefined as a quest not only for meaning but for a new way of life. A forsaken and forgotten Prisoner called upon humankind to finally break free from the ancient shackles of prejudice, violence, superstition, and material desire. The eventual placement of the Holy Dust of the Martyr-Prophet in the mausoleum on Mount Carmel - a signal victory of ‘Abdu’l-Bahá - and that Shrine's further beautification represented a striking reversal of the tragic circumstances surrounding the Báb's ministry. The juxtaposition of two mountains – Máh-Kú and Carmel – now comes into clear focus. "In this mountain I have remained alone," the Báb laments in referring to Máh-Kú, and "In His presence," He continues, "there is not at night even a lighted lamp!" How mighty is the All-Glorious One! 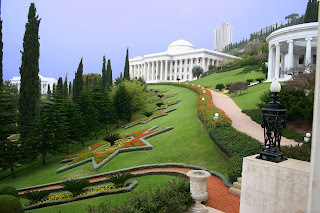 The Báb is no longer alone on the mountain; He is now at the center of "both the visible and invisible worlds": "the Point," as acclaimed by Bahá’u’lláh, "round Whom the realities of the Prophets and Messengers revolve," and "the Spot," as extolled by the Master, "round which the Concourse on high circle in adoration." Thus, as foreseen in the Holy Book, the Spirit of Elijah had come back to the mountain of the Lord to once again serve as a luminous beacon pointing to the "Perfect Way." The Sepulcher of the Báb is the "Queen" at the heart of the world who each day in her evening glory is the visible expression of the Báb's cry: "I am the Lamp which the Finger of God hath lit ... and caused to shine with deathless splendor." And tonight we shall see yet one more miracle: This mighty Lamp crowned in gold shall be encircled by a myriad other lamps, setting the entire mountain ablaze in light; and so we shall behold light upon light! "How great is the potency of thy might," is the Guardian's tribute to the "Queen of Carmel," "a might which has bewildered the souls of the favored ones of God and His messengers!" As she glows with brilliance, and with her wings spread over the guiding institutions of God's Cause, we cannot fail to recall the Divine assurance given to the Báb: "Be Thou patient, O Qurratu'l-'Ayn, for God hath indeed pledged to establish Thy sovereignty throughout all countries and over the people that dwell therein." The verdant natural mosaic now extending from the foot to the crest of Mount Carmel presents humankind with a profound message of hope. The struggle for the spiritual regeneration of the world, which is our Faith's ultimate mission, is, in some sense, given expression by the greening and blossoming of this mountain. As the variegated elements of the gardens encircling the Holy Precincts effloresce into ever more resplendent patterns of beauty, so too our teachings tell us "the earth of human potentialities will blossom with its own latent excellence and flower into praiseworthy qualities." But these capacities of the human spirit will only flourish "through the restoring waters of pure intention and unselfish effort." The magnificent gardens and flowing waters now decorating God's "Vineyard" speak to the nobility of human beings -- of what is possible for human society to achieve when it consciously turns to the bountiful outpourings of the Holy Spirit. They suggest quite directly that the transformation of the outer world is contingent upon an inner transformation of the heart. In 1911, ‘Abdu’l-Bahá, in His first public address in the West in London, declared, "This is a new cycle of human power. All the horizons of the world are luminous, and the world will become indeed as a garden and a paradise." As humanity traversed the subsequent decades of the century -- a century darkened by harrowing periods of ferocity and depravity and illumined by elevating flashes of creativity and unity -- ‘Abdu’l-Bahá's vision of a transformed world unfolded. While the full consummation of His vision is likely to occur only it the distant future, its essential features and direction have been irreversibly established. 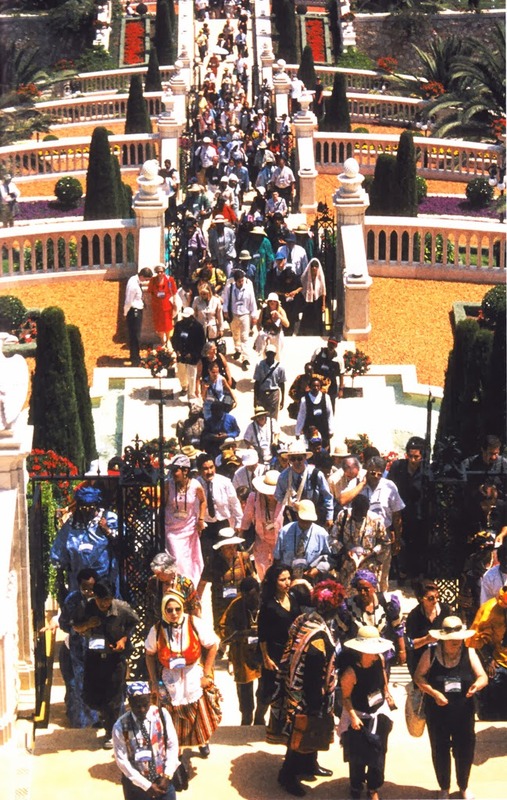 At this juncture, the very purpose of the Baháí community is to demonstrate that it is possible to create gardens of justice and understanding -- patterns of collective life based on trust, cooperation, rectitude of conduct, and genuine concern for others. May our own unremitting quest for unity in diversity illuminate others. And as the terraced gardens of Carmel manifest in their beauty and diversity the ideal of harmony, may the world itself recognize its capacity to effect the unity which is the only pathway to peace and well-being. We thus offer to humanity two powerful examples: ourselves and this mountain of splendor. 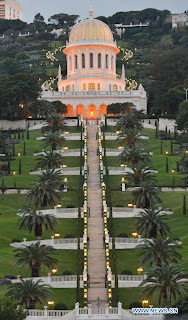 In executing the mandate given to him by the Master, the beloved Guardian, through immense effort and creativity, embellished the Shrine of the Báb with an "exquisite shell," designed the Arc on the Hill of God, and beautified the Holy Precincts. Each step he undertook in the development of the World Centre was matched by a great thrust forward in the teaching field. As Shoghi Effendi mapped the terrain of Mount Carmel, he also mapped the earth to every last degree. 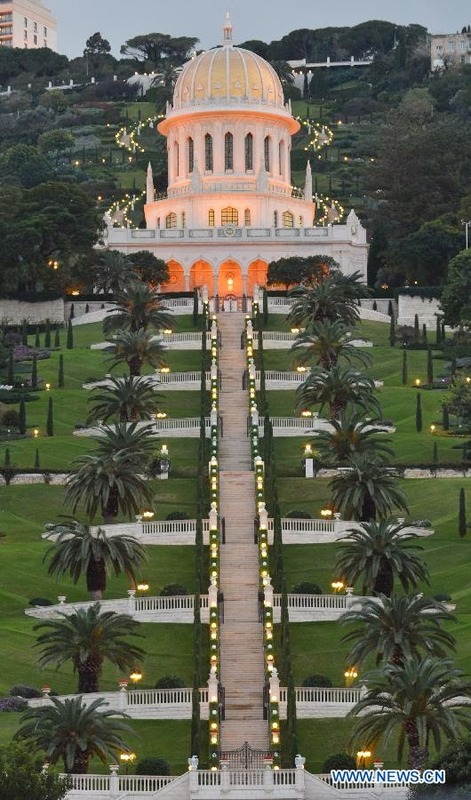 Under his energizing and divinely inspired leadership, and in accordance with the Plan conceived by the Center of the Covenant, a valiant band of believers extended the spiritual dominion of Bahá’u’lláh to the remotest regions of the globe, presenting to the world a working model of a unified "commonwealth of peoples." This response to the "summons of the Lord of Hosts" led to the great victory of 1963. With the election of the Universal House of Justice, the "sailing of the Ark" of God's laws mentioned in the Tablet of Carmel was realized. 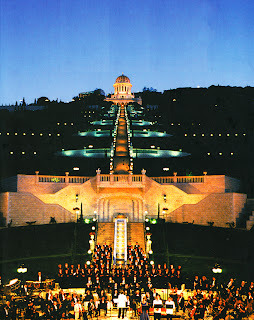 Through this unique collective act, the long awaited "scales of justice" had been raised by the Baháís of the world and "the Hand of Omnipotence" had "established His Revelation upon an enduring foundation." The "living waters of everlasting life," Shoghi Effendi indicated, would now "stream forth from that fountain-head of God's World Order upon all the warring nations and peoples of the world, to wash away the evils and iniquities of the realm of dust, and heal man's age-old ills and ailments." The establishment of the Universal House of Justice constituted a remarkable demonstration of the spirit of faith. This spirit was again manifest in the monumental projects of the past decade. Given the privilege of building up the agencies of the New World Order "foreshadowed by the Báb, enunciated by Bahá’u’lláh, and established by ‘Abdu’l-Bahá”  projects drew the support of every segment of our community. And how could it be otherwise? 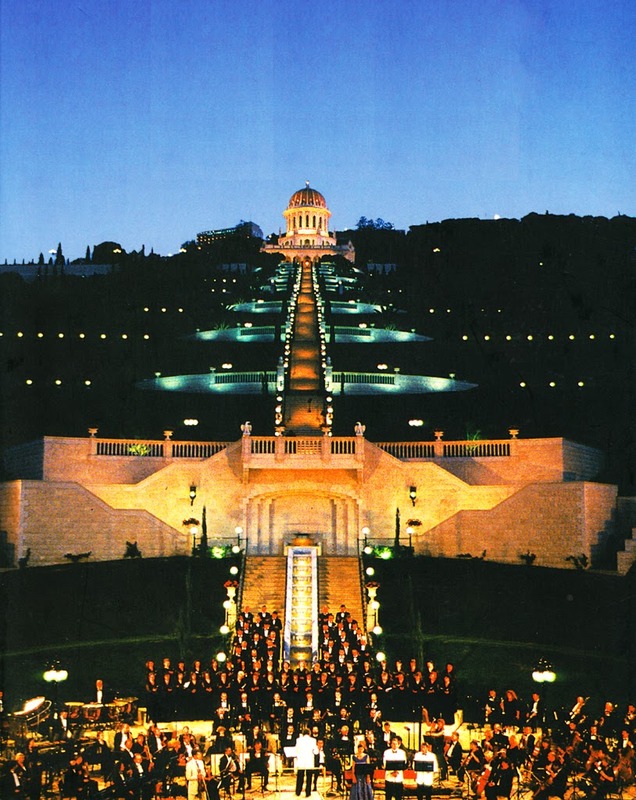 For as Shoghi Effendi has explained, the "World Administrative Center of the Baháí community.. .stands as the emblem symbolizing the basic unity of all nations, governments, and peoples, and as the seat of sovereignty and the dawning-place of both spiritual and temporal power. It is the supreme center to which the followers of His most sublime and glorious Faith must turn and the focal point which will mirror forth upon all regions the effulgent splendors of the celestial throne of Him Who is the Creator of men. It is the fountain-head of divine civilization which is the fairest, the noblest fruit of the Revelation of the Most Great Name...."
This then provides insight into our essential identity. As Bahá’u’lláh is the Prophet of civilization, we are the builders of civilization. As He is the Divine Educator, we are students learning to apply His teachings to the problems and needs of the world. As He is the Source of light, we are the agents of light, casting beams of love and confidence into the darkness. We are, therefore, instruments amplifying Carmel's call: "He that was hidden from mortal eyes is come! His all-conquering sovereignty is manifest; His all-encompassing splendor is revealed." 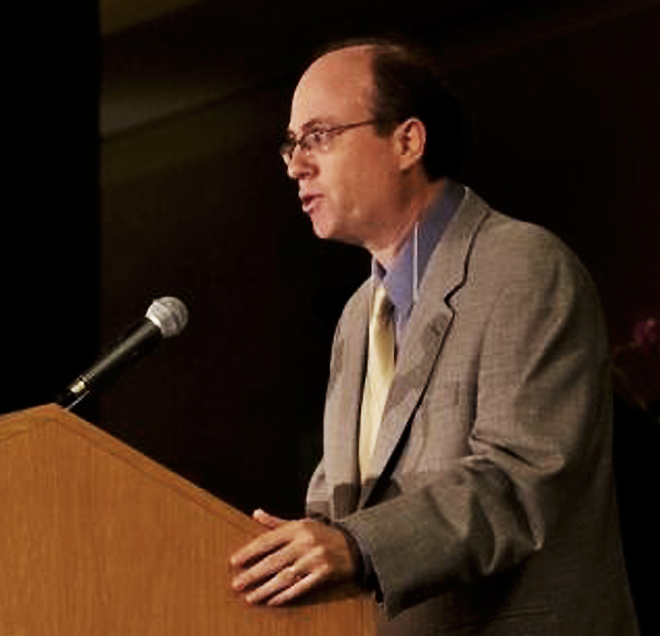 Our mission is the spiritual empowerment of the whole of the human family – to open up vistas of justice, freedom, and culture that have never before been seen. "A race of men," Bahá’u’lláh assures us, "incomparable in character, shall be raised up which… will cast the sleeve of holiness over all that hath been created ...."
The stunning structures on the Arc provide a glimpse of the civilization to be. In their features of balance, proportionality, and harmony they echo Baha’u’ah's exhortation to humanity to return to the Golden Mean, the "Middle Way” - to infuse all human endeavor with equity, mutuality of purpose, and moderation. In their sublimity and elegant solidity, the buildings now erected offer a striking contrast to the disintegrating institutions and bankrupt mores of a directionless society. To a shaken and agitated world they reflect the "calm new light of Peace and of Truth which envelops, guides, and sustains" those who have embraced the "law and love of Bahá’u’lláh." In pondering the significance of what the lovers of Bahá’u’lláh have wrought on the mountain of God, we can only recall the words of one of the seven martyrs of Tehran, who, while awaiting the moment of his own death, gazed upon the bodies of the two martyrs who had preceded him and who still lay entwined in each other's embrace. "'Well done, beloved companions!' he cried." Indeed, my brothers and sisters, well done! Bahá’u’lláh, quoted in a letter of Shoghi Effendi to the Baháís of the East, Naw-Ruz 101 BE. Shoghi Effendi, ‘Letter to the Baháís of the East, Naw-Ruz 111 BE, cited in Adib Taherzadeh, ‘The Covenant of Bahá’u’lláh.